During the American Civil War there were two Presidents, and two White Houses. 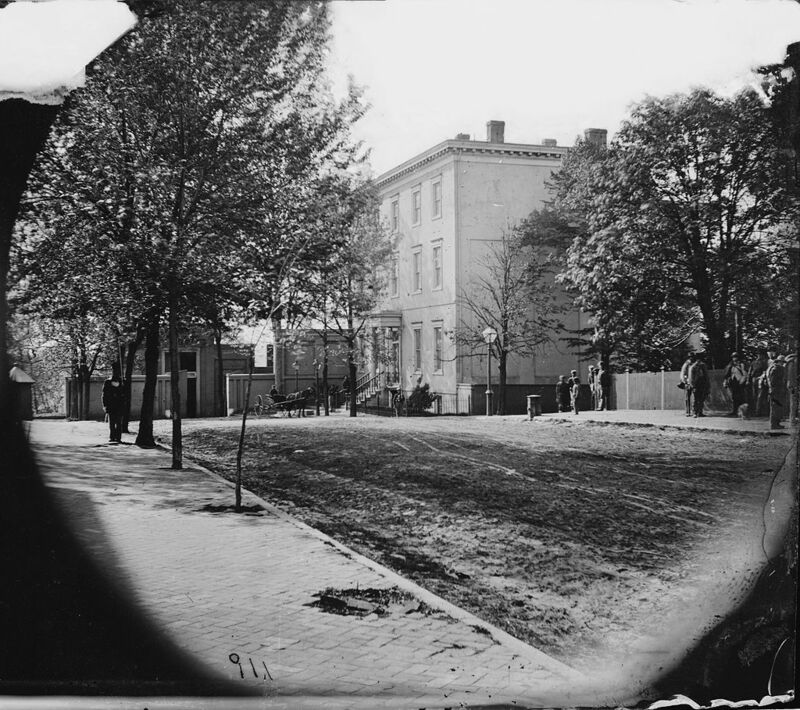 The Executive Mansion chosen by the Confederacy was a white, three-storey house in Richmond, Virginia. Not surprisingly, it became known as the White House. 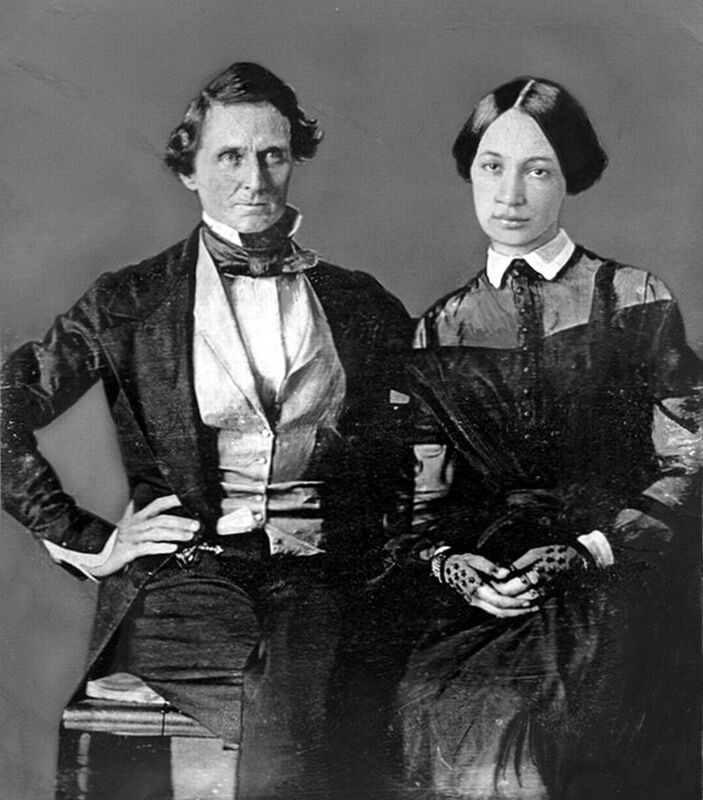 When Jefferson Davis moved into the Richmond White House in August 1861 with his second wife Varina, they had three young children, two boys and a girl. They had already lost their first-born, Samuel, who died before his second birthday. A fourth son would be born later that year. But there is no avoiding the fact that the tragedy occurred while both parents were out so Catherine was responsible for the children at the time. And Joe should not have been playing on the balcony. It seems Catherine left the employment following the tragedy, but why is unclear. Was she simply unable to continue, blaming herself for the event? Or did she suffer some form of breakdown from sheer anguish and, perhaps, guilt? Or was she dismissed by parents who blamed her for the death of their son? But Catherine is far from forgotten, if you take a tour of the Richmond White House, you won’t see the balcony; Davis had it torn down after the tragedy. But you will see the nursery complete with bed where Catherine slept. And the guide will mention her name and say a few words about her- Catherine, the Irish nanny. And so that will be her memorial. Postscript. By a strange twist of fate, Lincoln in the other White House would also lose a beloved son during the war. Despite the enmity, both Presidents exchanged heart-felt condolences with each other. The remaining two Davis boys would die young, so the ill-fated Davis’s buried all four of their sons. About Frank: I’m retired with a special interest in the American Civil War. I visit Virginia when I can. I stumbled on the Irish nanny reading Mary Chesnut’s diaries. I knew nothing of the story, but Chesnut’s decrial of the Irish nurse seemed to me unduly harsh- cruel in fact. It stuck in my mind unit I did the White House tour in Richmond. Standing in the little nursery, seeing the bed, imagining the horrors Catherine would have endured so far from home, was a moving experience; heart-breaking in fact. (1) Irish Central 21st July 2014. Photo found of Irish housekeeper Confederate White House. I have relied mainly on this article (which includes the photo) for details of Mrs. O’Melia. (3) Richmond Sentinel 2nd May 1864. 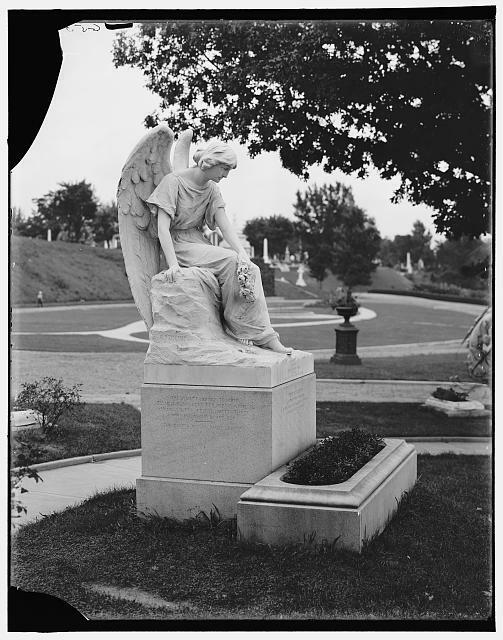 Melancholy Accident- A Child of President Davis Killed by a Fall. The full report reads: ‘Saturday evening the Presidential mansion in this city was the scene of a most melancholy occurrence. At 5 o’clock that evening one of the servants discovered President Davis’s third child, a little boy five years old, named Joseph, lying in an insensible condition on the ground, in year [sic.] of the back porch, with blood oozing from his mouth and nose and one of his thighs broken. The child had evidently fallen over the railing of the porch, a distance of, perhaps, twenty feet. None of the President’s family being in the house at the time, the ladies of the neighborhood were called in and medical aid sent for. Every effort was made to revive the little sufferer but without success. – The child continued to sink, and expired at a few moments before seven o’clock, having lived about two hours after the discovery of the accident. How long after the accident before it was discovered is not known.’ This press report appeared two days after the accident, and contains a number of discrepancies in detail with other contemporary accounts. Another account is available from The Papers of Jefferson Davis, Rice University which you can access here. ; Mary Boykin Miller Chesnut. A Diary from Dixie: 1823-1886. Chesnut’s descriptions of events are included at May 8th and May 27th. Chesnut was very close to Varina, and stayed with the family on the night of the tragedy. She writes with great emotion about the event, and her account is probably accurate and reliable. Incidentally, she quotes the words that first informed her of the tragedy: ‘Little Joe! he has killed himself’ – a strange phraseology to describe the accident! ; The Papers of Jefferson Davis, Rice University (click here): ‘Rumors persist that he was pushed by older brother Jeff Jr., but there is no evidence to support this story.’; Kimberly J. Largent. The Life of Varina Howell Davis: First Lady of the Confederacy. This contains a quote from Varina’s memoirs with her description of the tragic day: ‘I left my children quite well, playing in my room, and had just uncovered my basket in [Jefferson’s] office when a servant came in for me. The most beautiful and brightest of my children, Joseph Emory [sic. Joe’s second name was Evan- Joseph Emory was JD’s older brother]. Joseph had in play climbed over the connecting angle of the banister and fallen to the brick pavement below. He died a few minutes after we reached his side. This child was Mr. Davis’s hope and greatest joy in life.’; Mary Boykin Miller Chesnut. A Diary from Dixie: 1823-1886, entry of May 8th 1864. (4) Mary Boykin Miller Chesnut. A Diary from Dixie: 1823-1886. Entry of May 27th, 1864. These words were written four weeks after the tragedy. Chesnut has no sympathy for Catherine; in fact, she seems to be accusing her of hypocrisy. Maybe she believed that Catherine’s tears were from guilt rather than from grief. Did Varina share this harsh judgement? I don’t think so, but it is possible that Chesnut is reflecting Varina’s private thoughts as confided to her close friend. (6) Varina Ann Davis 1888. An Irish Knight of the Nineteenth Century. New York- John W. Lovell Company. Thank you, for these Tales of ‘love and light’. Thank you for the story. I just moved to Richmond to take in all of it’s history. The Confederate White House in on my list. Your story will add a new dimension to my visit. Hi I visited the Rebel white house and found it fascinating as well as the very extensive biography of Verina Davis that I found in the gift shop. Seems there was a lot more tragedy in this family and only one child lived to adulthood but not for long. She too died in her 20s if I am not mistaken.I believe Verina’s Irish roots go back to the Revolution or before. .Thank you for this lovely post on the family. Brighid O’Sullivan of celticthoughts.com.